Katie Quirk is the author of A Girl Called Problem, a middle-grade novel set in Tanzania. She is currently working on two books: Sari Swinging: One Mom Opts out of the American Work-Family Grind, a parenting memoir about life with a newborn baby in India; and Kurinji, a young adult novel set at a boarding school in the mountains of South India. Katie’s essays and articles–listed below–have appeared in publications including The Washington Post, The New York Times, Slate, The Los Angeles Times, Orion, and The Christian Science Monitor. She blogs about family gap years abroad at Warmer Than Canada. Katie has a BA in French literature from Haverford College and an MFA in creative writing from Mills. Originally from Washington state, Katie has taught English and writing for over ten years to students as diverse as Spanish-speaking third graders in the California farm belt, Berkeley community-college students, high school students in India, and adults in Tanzania and Costa Rica. She currently lives with her family in Maine. “Enjoying Belize in the Moment.” The Los Angeles Times: March 3, 2019. “Having ‘The Talk’ With My Kids: What I Said to My Sons About Gun Violence.” Yes! Magazine: April 2, 2018. “Multigenerational Family Travel Isn’t for the Birds.” The Boston Globe: March 28, 2018. “Building a Baby Sleep Machine in India.” The New York Times: January 26, 2018. “These graphic novels were a lifeline for my kids during a year in Central America.” The Washington Post: August 21, 2017. “How My Costa Rican Neighbors Jolted Me Out of Climate Activist Apathy.” Slate: August 8, 2017. “Whether you’re traveling in Nevada or Nicaragua, here are five rules for keeping your kids happy.” The Los Angeles Times: May 27, 2017. “How a soccer coach is teaching my American kids that yes, winning matters.” The Washington Post: March 27, 2017. “Modesta’s, and my, life-changing choice.” The Christian Science Monitor: March 1, 2017. “I’m raising a bilingual child, perhaps to his dismay.” The Washington Post: Feb 1, 2017. “The election was over, and yet we marched” The Tico Times: Jan 24, 2017. “Just say sí: A family spend a month in Guatemala trying to learn the language–but did it work?” Los Angeles Times Travel: Jan 16, 2017. “Bernie Stole My Feminist Heart (But It’s Complicated).” Yes! Magazine: March 31, 2016. “Day of the Girl Child.” From the Mixed-Up Files… Blog: October 9, 2014. “Girls Matter: Author Katie Quirk on the International Day of the Girl.” A Mighty Girl Blog: October 11, 2013. “A Girl Called Problem–Fiction Meets the Day of the Girl.” Day of the Girl Blog: October 9, 2013. “When America and Africa Met at Seven Roads.” 7 Roads Magazine: October 2013: 13-15. “Roads Taken and Not Taken: Katie Quirk ’98.” Haverford Magazine: July 2013. “Authoring Stories About Cultures Not Our Own.” Nerdy Book Club Blog: June 30, 2013. “Real ‘Girl Power:’ Courage and Hope in East Africa.” EerdWord Blog: May 15, 2013. “An African Story: Katie Quirk ’94.” Saint George’s Magazine: May 2013. A Girl Called Problem. April, 2013. “Cover Stories: A Girl Called Problem:” Melissa Walker’s Cover Stories Blog: March 25, 2013. “The Story Behind A Girl Called Problem:” Crowe’s Nest Blog: March 19, 2013. “Child Study Center.” Maine Alumni Magazine: Summer 2011: 18-19. 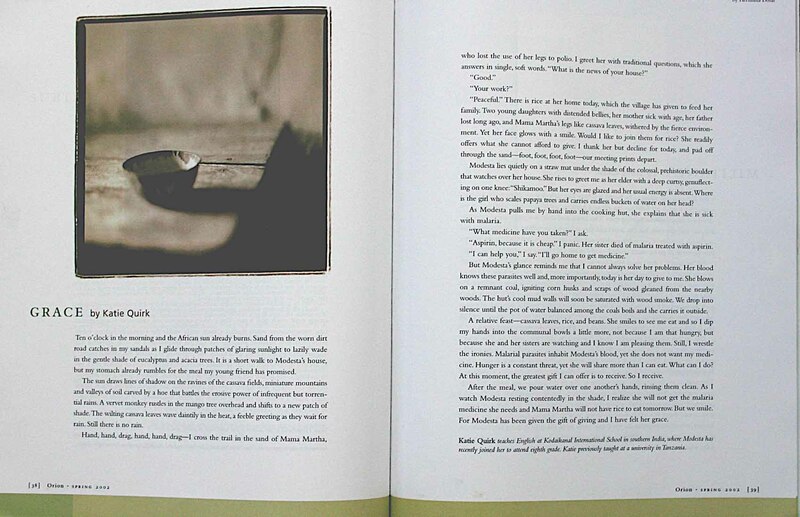 “How Mama Farida Lost Hope, Her Home, and Her Family.” San Francisco Chronicle 21 May, 2006: Sunday Insight. “From Sydney to Bombay–with a teaching post overseas you can take your career with you.” International Living December 2006: 13-15. “Grace.” Orion Spring 2002: 38-39. “A Modest Hope for Modesta.” Commonweal 12 Jan. 2001: last page. Over thirty articles published in the Spokesman-Review (1993-2000).